The Diversity in Education site consists of hundreds of detailed summaries of research about education. Each research summary consists of a “reference” to a research article, summarizing the research questions the article addresses and the article’s findings. These research summaries can be filtered by keywords, research design, methodology, analysis method and units, data and sampling types and more. Archive pages can be filtered by multiple taxonomies including, archive, keywords, research designs, analysis methods and researchers. By default, all article references are sorted by publication year, with the most recent articles listed first. Articles can also be sorted by the last name of the primary author. Checking any box in the filter fields will add that taxonomy term to the filter. Multiple taxonomy terms can be selected. With each selection, the list of terms for every taxonomy is updated to show only terms that are included in articles containing the selected terms. 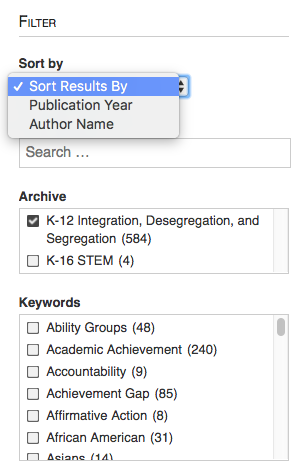 The filter fields also display the number of articles that contain a given taxonomy term. These numbers are also updated as additional terms are selected. Taxonomies used to organize articles can be browsed alphabetically. Some taxonomies such as keywords include a cloud of terms configured to show more commonly used terms in larger letters.